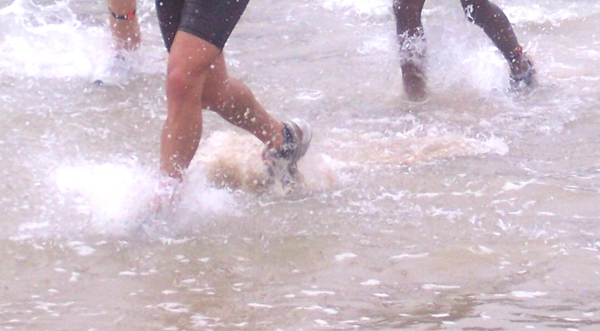 Good luck to all those competing in the Surfers Marathon tomorrow, Saturday 16 February 2013! The Surfers Marathon is an annual race in East London that started in 1975. The Surfers Marathon in East London is not really a marathon in the traditional sense, since the official distance of a marathon is 42.2 km. The Surfers Marathon (or Discovery Surfers Challenge) is currently about 17.5km. The Surfers Marathon distance has been debated over the years. When I did my first Surfers Marathon in 1992, at the age of 22 (in a time of 1 hour 43 minutes, and finishing as the 9th lady runner home), I was under the impression that all entrants thought that the Surfers Marathon distance was 18km, but as time went by it was declared by many in the know that the distance was 16km. 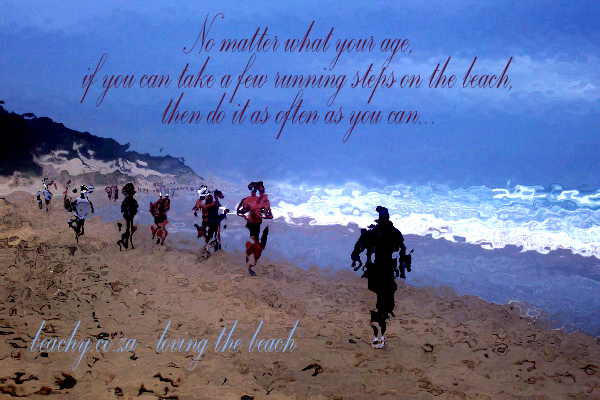 Running on the beach – runners, during the 2010 Surfers Marathon in East London, near Bonza Bay beach. 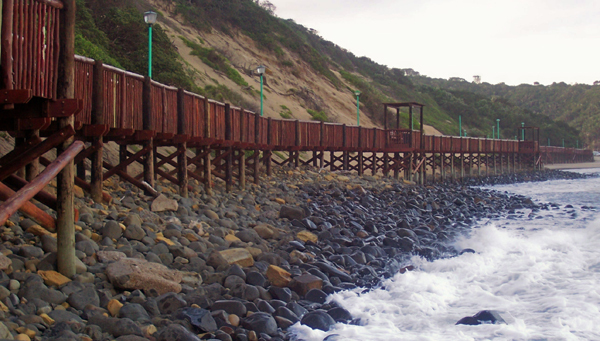 To avoid damage to the Gonubie boardwalk, and to avoid having to cope with a possible high tide splashing up against one and against the bottom of the sand dunes next to the Gonubie boardwalk, the Surfers Marathon route was slightly changed, over the past few years. 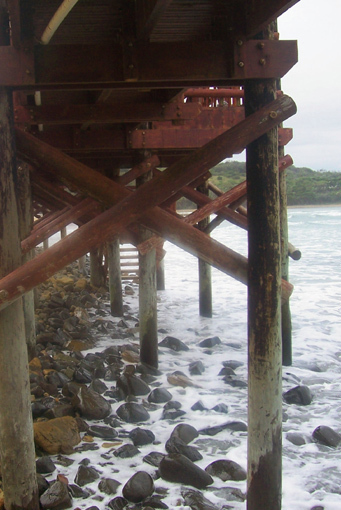 Neither the boardwalk or the sand dunes next to the boardwalk are at risk of damage during the Surfers Marathon anymore. Once through the Gonubie River, and across a bit of Gonubie Beach, one feels tar beneath one’s feet for the first time since the start of the race. 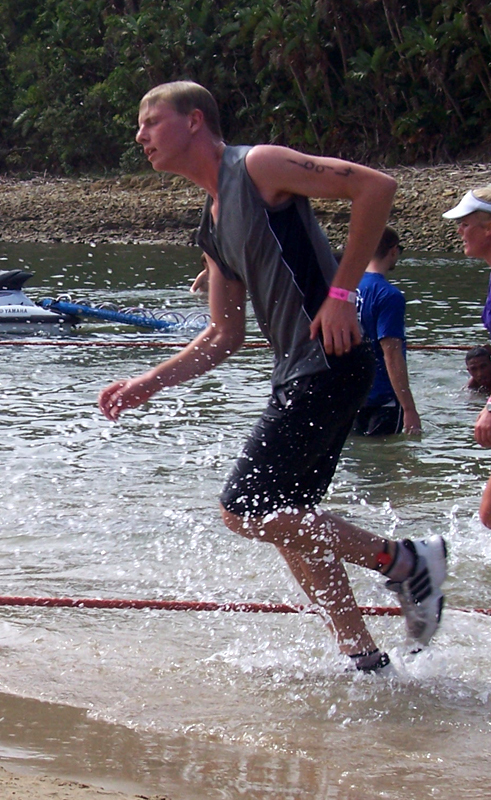 About one third of the race is over – the roughly one third that is sand and/or rocks. The middle third is on tar, with the final roughly one third seeing runners and walkers tackle sand again, and the crossing of the Nahoon River, before the final 300 to 400 metres across sand to the finish line in front of the Nahoon Lifesavers Shack on Nahoon Beach. Of course the paddlers don’t touch the sand or tar at all, except for some sand right at the end. Last year (2012) saw the introduction of a 5km challenge for the younger set. Since the race starts at Kwelera River Mouth and finishes at Nahoon Beach, one cannot park at the start and return to one’s car after the race. In fact there is no parking at the start. One is either dropped at the start by a friend or family member, or one catches a bus to the start. Many Surfers Marathon competitors choose to take the bus. It’s almost a tradition to take the bus and start getting into the spirit of the race by chatting with your fellow bus passengers. “How many have you done?” is usually the ice-breaker. To have your own car at the finish after the race, one needs to park at the finish – in the grassy field area just up the road from Nahoon Beach (the lifesavers shack side, at the bottom of Beach Road, Nahoon) then catch the bus to the start, or get a lift. Traditionally the busses left from that same grassy field at the bottom of Beach Road, but last year it was declared that the busses would be leaving from only Oxford Striders, further up Beach Road. Even so, there were still some busses at the grassy field at the bottom of Beach Road – this must have upset those who hadn’t felt like walking up to Oxford Striders to catch a bus, but did, and then saw those busses come past, filled with excited Surfers Marathon competitors. For tomorrow’s 2013 Surfers Challenge, the busses are supposed to be leaving from the badminton hall, opposite Stirling High School, between 12 and 12.30pm, ahead of the 2.30 pm start of the race, but I wonder if some busses won’t also be on that grassy field at the bottom of Beach Road, like last year. HOWEVER, an sms doing the rounds today 15 February 2013, supposedly from the organizers of the race, is telling people that there will now be no busses to the start, and that surfers entrants need to make their own arrangements to get to the start. If this sms is true, hopefully the organizers can come up with another arrangement to get people (who usually park at the finish and take a bus to the start) to the start of the race at Kwelera River Mouth. UPDATE: Another sms later today (Friday, the day before the Surfers Marathon) announced that there would be a limited amount of taxis and busses available at the bottom of Beach Road and at the badminton Hall from 11.30am to transport entrants to the start. 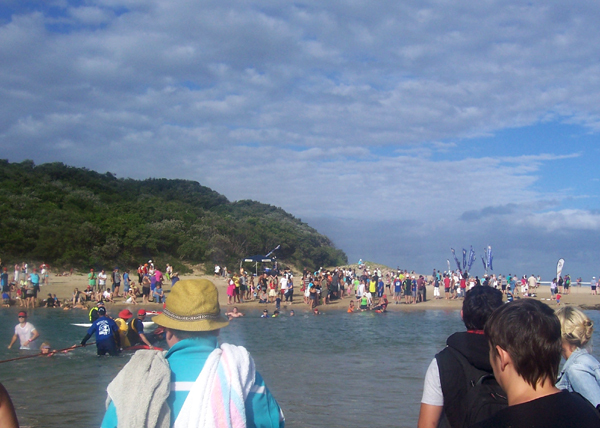 The start of the race is at 2.30pm at Kwelera River Mouth. 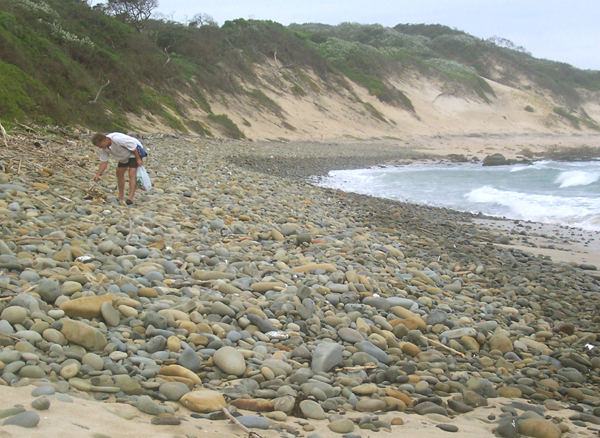 After the start at Kwelera River Mouth, the route takes runners and walkers through the following beaches of East London: Sunrise on Sea, the rocky beach of Rainbow Valley, a little bit of Gonubie Beach next to the Gonubie River and into and through the car park (after crossing the Gonubie River – cross at the ropes if the current is strong and you are not certain of your swimming abilities! ), back down to the sand after the second third of the race which is on Gonubie coastal-hugging tar, then head to and pass Bonza Bay Beach, and on towards the finish at Nahoon River Mouth and Nahoon Beach. Tony and I are not competing tomorrow (or it would have been Tony’s 4th Surfers Marathon and my 16th) but we’ll be along the route to support everyone and to support my 15 year old son doing his 3rd. Perhaps we’ll take a few photos too. Maybe we’ll see you along the route – good luck, and have fun!